Every once in a while, something appears in the night sky that attracts the attention of even those who normally don't bother looking up. It was that way on Monday evening. A slender crescent moon, just 15 percent illuminated, came in very close proximity to the two brightest planets in our sky, Venus and Jupiter. People who were unaware or had no advance notice almost certainly wondered, as they cast a casual glance toward the moon, what those two "large silvery stars" happened to be? I was lucky enough to look up at the sky, during a clear spell, and caught a glimpse of the event. The picture above isn't mine, but it was taken in Ireland. 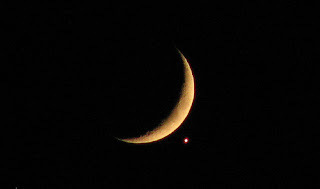 Venus is seen just under the moon, while Jupiter is just out of shot. It was a beautiful and rare spectacle and won't happen again until 2053!